There was a time when dining in a hotel restaurant was something you did when you were out of town and actually staying on the premises. Prices were typically elevated, and food quality not necessarily on par with cost. The stigma attached to dining in a restaurant that can be accessed through a lobby is most definitely a thing of the past. Today some of the best restaurants in DC just happen to be situated in hotels. 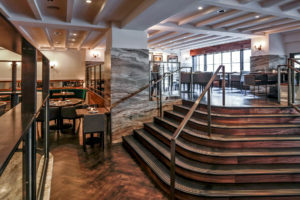 Tredici Enoteca is located in the St. Gregory Hotel near Dupont Circle. The food is influenced by Mediterranean flavors from Italy, Greece, and the Middle East. 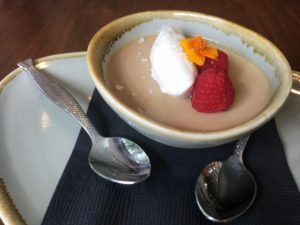 The restaurant recently launched brunch, and my husband and I were invited to check it out. The menu accommodates a variety of tastes. There are small plates and full-size entrees with a mix of traditional brunch fare and more distinctive Mediterranean offerings. Eggs benedict, steak frites, chicken and waffles, and challah French toast juxtapose against an alluring Mediterranean board of falafel, hummus, and tzatziki. 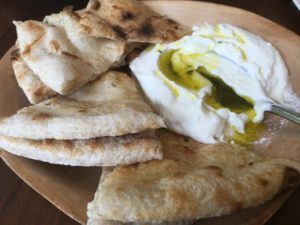 A scoop of ricotta dressed with honey, olive oil, thyme, and orange zest is served with warm crispy flatbread made in-house. It’s irresistibly bright and citrusy. While the plan is to share, I can’t help but discreetly inch the plate closer to my side of the table. 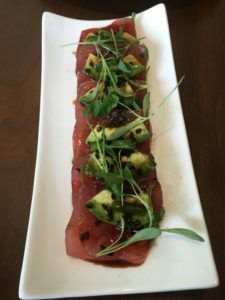 Tuna crudo with avocado, black sesame, and sweet soy provides a refreshing balance against the substantial ricotta dish. My husband and I flip over the Moroccan Egg Scramble- a dish we both recommend with absolutely no reservations. Chef de Cuisine Nicholas Martino slow bakes chick peas with cinnamon and star anise and sprinkles them over a mixture of eggs, spinach, cilantro, red pepper, and onion which he then tops with a toss of arugula. 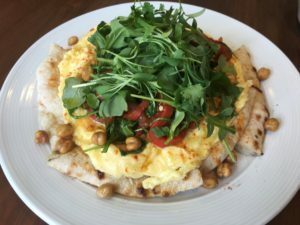 The eggs are served atop flatbread, which serves to upgrade any dish in which it appears. Desserts are off menu, but shouldn’t be overlooked. We conclude our meal with a bowl of creamy butterscotch pudding, lightly sprinkled with sea salt. The handsome decor at Tredici Enoteca is designed to evokes the hues of the Tuscan countryside with flourishes of brown, green, and blue. The view onto M Street, NW doesn’t quite say Italy, but the interior appeal is undeniable. Tredici Enoteca is an alluring brunch spot, and you don’t have to check into the St. Gregory Hotel to check it out.